TransAM NF?B Kits provide everything needed to study Nuclear Factor ?B (NFkB), including a positive control extract. The TransAM NF?B Chemi Kits couple the TransAM method to highly sensitive chemiluminescent detection. This format offers improved sensitivity and a greater dynamic range. Kits are available with antibodies specific for the activated form of p50, p52 and p65. 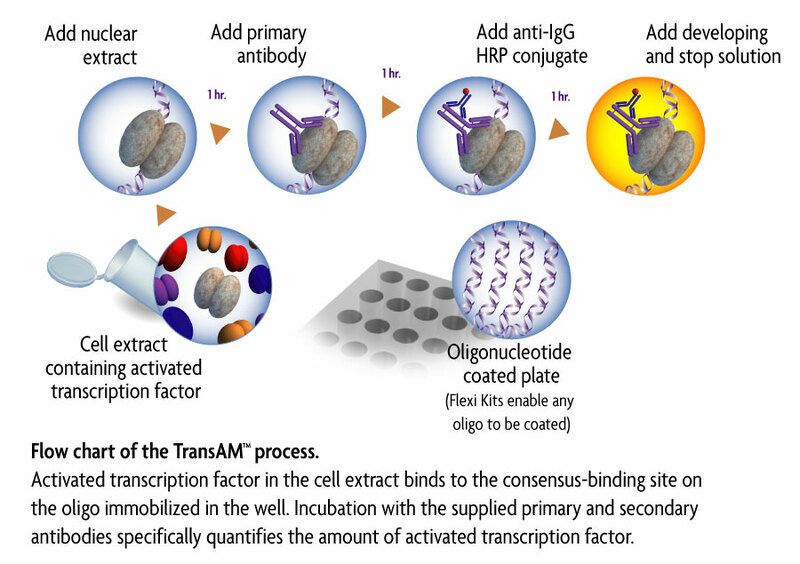 Recombinant p50 and Recombinant p65 proteins are available separately to generate an optional protein standard curve in the TransAM NF?B Transcription Factor ELISA kits. The TransAM® Chemi tab below provides complete method details; the NFkB Info tab gives an overview of the NF?B transcription factor as well as kit data; the kit manual can be downloaded under the Documents tab. TransAM NF?B p50 Chemi sensitivity. Nuclear extracts from Jurkat cells and Jurkat cells stimulated with TPA and calcium ionophore were assayed from 0.039 to 2.5 µg/well for NF?B p50 activation using the TransAM NF?B p50 Chemi Kit. 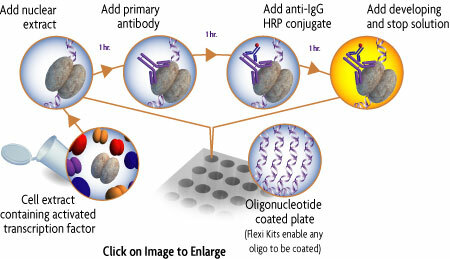 One or five NF?B 96-well assay plate(s) with plate sealer(s), NF?B p50, p52 or p65 primary antibody, HRP-conjugated secondary antibody, NF?B wild-type and mutated oligonucleotides, positive control cell extract, DTT, Protease Inhibitor Cocktail, Herring Sperm DNA, Lysis, Binding, 10X Washing and 10X Antibody Binding Buffers, and Chemiluminescent Substrate Solutions. Reagent storage conditions vary from room temperature to -80°C, see manual for details. All reagents are guaranteed stable for 6 months when stored properly.